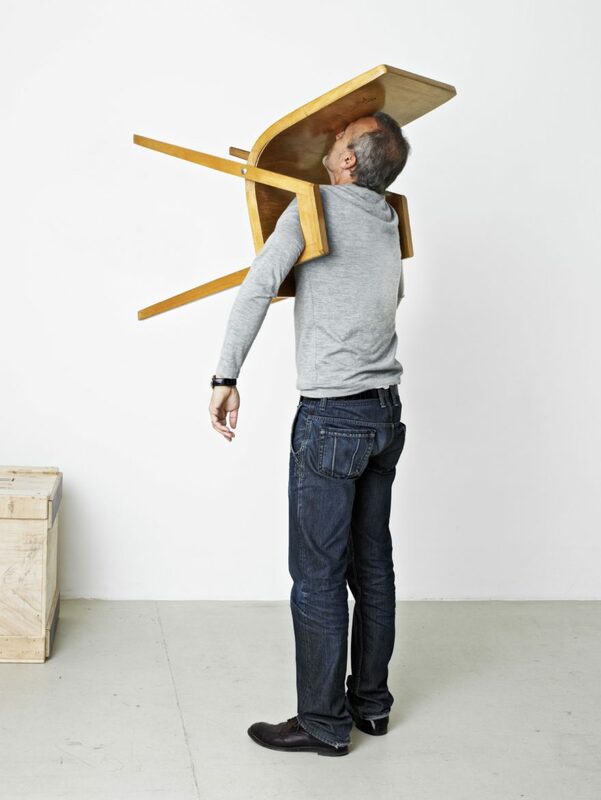 Erwin Wurm. Hot Dog Bus. Brooklyn, 2018. 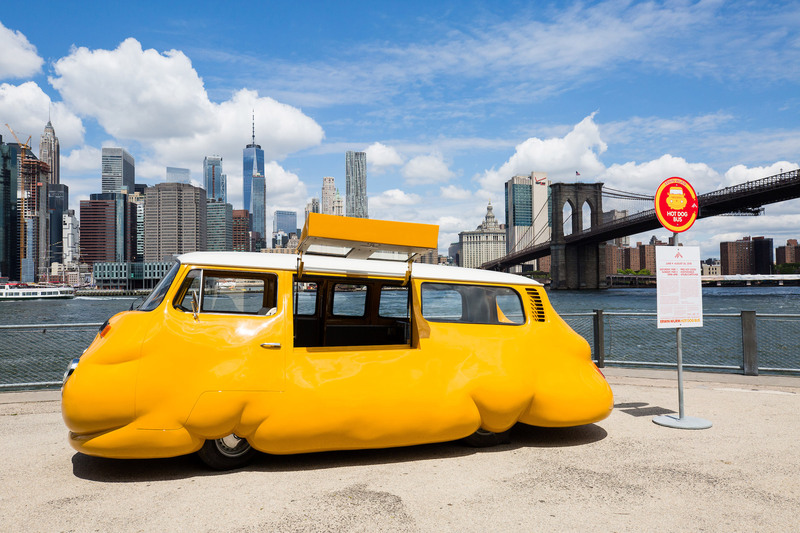 Erwin Wurm’s latest mini-masterpiece, a comically corpulent custom VW microbus, endowed with a gleaming, perfect French’s-Mustard-yellow paint job, has waddled its way to Brooklyn this summer, to sit, or more accurately, squat, on a pier in Brooklyn Bridge Park, ready to bestow a single complimentary wiener upon anyone who asks. Supplies are limited. Erwin Wurm. A selection of One Minute Sculptures. Like any artist who traffics in the tragicomic, Wurm takes his humor very seriously. Hot Dog Bus seems to be a continuation of his famous One Minute Sculptures, in which the beholder is asked to participate with an object, to become the sculpture for sixty seconds. The participant enters these works by following Ikea-like illustrated directions. He might be instructed to put his head in a head-sized hole in a credenza, or pull on a modified Danish-modern bench like a pair of trousers. When participating in Wurm’s One Minute Sculptures, the participant becomes acutely aware of her precarity – the positions she is directed to assume are strange, unnatural, and uncomfortable. The participant-sculpture becomes suddenly aware of entering the world of things, of being beheld by others, and is made acutely aware of the powers of absurdity. And then those sixty seconds become an eternity. What might initially seem like some kind of high-brow prop comedy becomes something more – not a meditation on, but a demonstration of the absurdity, fragility and finitude that is the result of living our human lives as bags of meat, blood, bones, and organs. 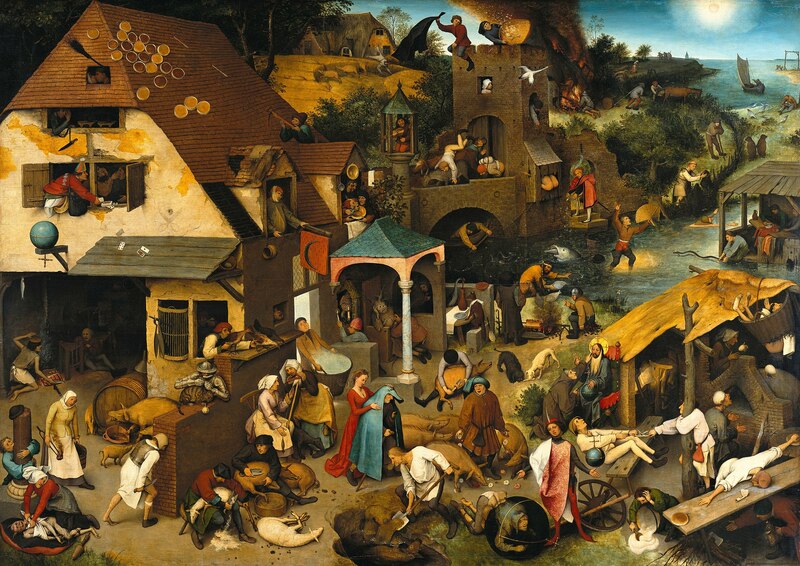 Pieter Brueghel the Elder. The Dutch Proverbs or The Blue Cloak or The Topsy Turvy World. 1559. As it turns out, it takes about a minute to consume a hot dog, in this case dispensed from a roly-poly, yellow, vaguely European cartoon character staring at us with adorable bug-eyed headlights. But this is no cartoon land. Entering Wurm World is more like entering a Bruegel painting, becoming a bit player in, say, Netherlandish Proverbs or Children’s Games. The park becomes the painting, the beholder becomes an actor, like everyone else in the park, engaged in some all-consuming activity – throwing a ball, poking at one’s cellphone, taking selfies, sunning oneself – that exists somewhere on the spectrum of absurdity. Wurm’s proverb warns us about the corporeal consequences of consumption. As with other One Minute Sculptures, the experience grows increasingly disquieting. In Wurm World, each bite of the dog seems ridiculous. Each chew becomes teeth gnashing on a tube of ground animal. Mustard becomes a viscous lube, catsup something worse, and the roll, a sticky, saliva-soaked mass. Mahlzeit! Erwin Wurm. The Idiot III (A One Minute Sculpture). 2010. In the end, Wurm’s free hot dog comes at a price – an awareness that the pleasures of consumption may not be all that pleasurable after all, and the pursuit of this mirage has its own consequences. Wurm’s proverb reminds us of a basic equation responsible for human catastrophes great and small: unattainability feeds insatiability and insatiability feeds gluttony. Wurm’s comically corpulent bus reminds us that gluttony is still a sin even in a secular world. Hot Dog Bus invites us to chew on that. Through August 26, Hot Dog Bus will be parked on Pier 1 on Saturdays and Pier 5 on Sundays, in Brooklyn, from 12pm until 6pm. For more information, visit the Public Art Fund’s website.